P.F. 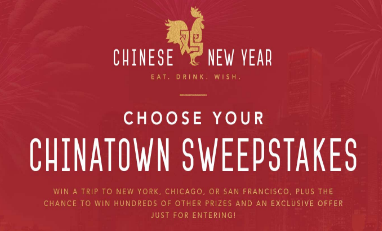 Chang’s Choose Your Chinatown Sweepstakes and Instant Win Game – Win a trip & more! Win a trip to winner’s choice (NYC, San Francisco or Chicago) for a Chinatown experience & more! ENTRY LIMIT – Limit: Each entrant may enter/play/share socially one (1) time per day during the Promotion Period. ELIGIBILITY – The P.F. Chang’s Choose Your Chinatown Sweepstakes and Instant Win is open only to legal residents of the fifty (50) United States (including District of Columbia) who are at least eighteen (18) years old at the time of entry. SWEEPSTAKES ENTRY PERIOD – The Promotion begins on January 2, 2017 at 12:00 a.m. Pacific Time (“PT”) and ends on February 4, 2017 at 11:59 p.m. PT. accommodations at a hotel determined by Sponsor in its sole discretion (single room, double occupancy); $500 prepaid gift card that may be used for spending money; a $100 P.F. Chang’s digital gift card, terms and conditions apply; and travel agent services. Winner must complete the trip within one (1) year from the drawing date or prize will be forfeited. Approximate Retail Value (“ARV”): $3,100. Social Sweepstakes Prize: ONE (1) FIRST PRIZE: A $100 P.F. Chang’s digital gift card, terms and conditions apply. ARV: $100. Instant Win Game Prizes: TWO HUNDRED (200) SECOND PRIZES: A $25 P.F. Chang’s digital gift card, terms and conditions apply. ARV: $25. Benjamin Moore “Uncover Your Color” Sweepstakes & IWG – Win a trip & more! Win a trip, $500 spending money & more! ENTER SWEEPSTAKES HERE – Benjamin Moore Sweepstakes page. ENTRY LIMIT – Limit one Sweepstakes Entry per person/email address per day during the Promotion Period. ELIGIBILITY – The Promotion is open to legal residents of the 50 United States or the District of Columbia and Canada, who are at least 18 years of age or the legal age of majority in their state/province/territory of residence (whichever is greater), at the time of participation. 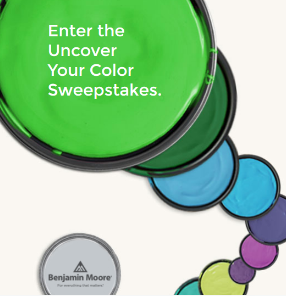 SWEEPSTAKES PERIOD – The Benjamin Moore “Uncover Your Color” Promotion begins on or about 12:00:01 a.m. Eastern Time (“ET”) on May 12, 2014 and ends at 11:59:59 p.m. ET on June 22, 2014. Grand Prize (1): A three (3) day/two (2) night trip for winner and one (1) guest to the Benjamin Moore Showroom located in San Francisco, CA; New York, NY; or Chicago, IL (determined by the Sponsor). Trip package includes round-trip coach-class air transportation for two (2) from a major U.S./Canadian gateway nearest winner”s home (determined by Sponsor in its sole discretion) to either San Francisco, CA; New York, NY; or Chicago, IL (determined by the Sponsor); two (2) nights standard accommodations at a hotel to be determined by the Sponsor (single room, double occupancy); an opportunity for a 1-hour consultation with a Benjamin Moore designer and a Benjamin Moore color expert for one room of winner”s choice; $500 USD spending money, awarded in the form of a check payable to winner; roundtrip ground transportation to and from the destination airport, hotel and Benjamin Moore Showroom (Winner and guest are responsible for transportation to and from his/her home to the selected airport). ARV: $4,000 USD. Secondary Prizes: (75,480) A maximum of fifteen (15) Secondary Prizes (5 of each of the following three Secondary Prizes) shall be available per participating Location: (a) Benjamin Moore Color Samples, Approximate Retail Value (“ARV”) $7 each; (b) Benjamin Moore Fan Decks, ARV is $15 each; (c) One (1) quart of Benjamin Moore paint, ARV is up to $24 USD each. A total of 225 Secondary Prizes (75 each of the three Secondary Prizes), shall be available via Mail-in Game piece request. Sweepstakes Prizes: Grand Prizes (5): A Benjamin Moore Uncover Your Color Package to be awarded in the form of a $250 Benjamin Moore gift voucher. Voucher terms and conditions apply. ARV: $250 USD. American Express Travel Great Escape Sweepstakes – Win a trip & a $2,500 American Express gift card! Win a trip (choose between NYC, Chicago, San Francisco or Los Angeles) and a $2,500 American Express gift card! ENTER SWEEPSTAKES HERE – American Express Travel Sweepstakes page. ENTRY LIMIT – Limit: You may receive up to fifteen (15) entries during the Promotion Period. (One initial entry, ten from answering trivia questions and four for sharing the sweepstakes with friends). Answers to the questions: 1.c) 2.a) 3.d) 4.d) 5.a) 6.a) 7.a) 8.a) 9.d) 10.a). ELIGIBILITY – Great Escape Sweepstakes is open only to legal residents of the fifty (50) United States and the District of Columbia who are at least eighteen (18) years old at the time of entry. SWEEPSTAKES PERIOD – The Sweepstakes begins on April 8, 2014 at 12:00 a.m. Eastern Time (“ET”), ends on May 31, 2014 at 11:59 p.m. ET. PRIZES – A trip for two (2) to one of the following cities: New York, NY; Chicago, IL; San Francisco, CA or Los Angeles, CA (to be selected by winner). Trip package includes a three (3)-night stay at a hotel determined by Sponsor (one (1) standard room, double occupancy) in the selected city (based on availability and black-out dates) and a $2,500 American Express® gift card (terms and conditions apply) that winner may use for airfare and all other costs and expenses related to the trip not included herein as being provided. Winner will be required to designate city and travel dates on the Affidavit/Release. Winner must use the hotel stay between June 15, 2014 – November 15, 2014 or this prize component will be forfeited. Hotel stay will be booked by Sponsor’s agent and dates of hotel stay cannot be changed once booked. Approximate Retail Value: $4,400 to $5,650 (depending on the hotel/city selected). al fresco Food Network in Concert Sweepstakes – Win a trip to Chicago & more! 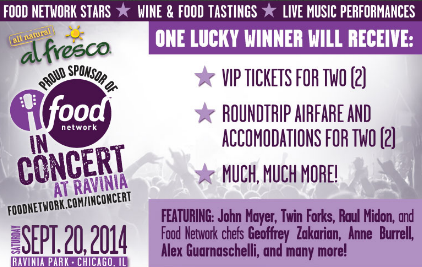 Win a trip to Food Network in concert at Ravinia Park in Chicago & more! ENTER SWEEPSTAKES HERE – al fresco Facebook page. ENTRY LIMIT – Limit: One online entry per person or email address per day. ELIGIBILITY – The “al fresco Food Network in Concert Sweepstakes” is open to legal residents of the 50 United States and the District of Columbia (U.S.), age 21 or older at the time of entry. SWEEPSTAKES PERIOD – Online entries must be received between 12:01 AM, Eastern Time (“ET”) Sunday, April 13, 2014 and 11:59 PM Eastern Time (“ET”) Saturday, June 7, 2014. The Total Approximate Retail Value (“ARV”) of the Grand Prize is: $3,362.00. The grand prize package will be awarded on September 19, 2014. The 2014 Antiques Roadshow Sweepstakes – Win a trip to Chicago & more! ENTER SWEEPSTAKES HERE – PBS Antiques Roadshow Sweepstakes. ENTRY LIMIT – There is a limit of one (1) online entry via the online entry form (known as the “base” entry) per eligible person per day during the Promotion Period, regardless of the number of email addresses or accounts a person may have. ELIGIBILITY – The “2014 Antiques Roadshow Sweepstakes” is open only to legal residents of the 50 United States, Puerto Rico, Guam, the US Virgin Islands, the District of Columbia and Canada (excluding the province of Quebec), who are 18 years of age or older (or the age of majority in the jurisdiction of their residence, whichever is older) and who possess, respectively, a valid United States photo identification or Canadian Passport with an expiration date after December 31, 2014. SWEEPSTAKES PERIOD – The Sweepstakes begins on or about 12:00:00 a.m. (midnight) EDT on January 20, 2014 and ends 11:59:59 p.m. EDT on May 12, 2014. -round-trip ground transportation to and from the airport and the Hotel if the Grand Prize Winner travels to Chicago by air. Total ARV (Approximate Retail Value) of the Grand Prize: up to $4,900.00. All travel to and from Chicago must occur, respectively, on July 25 and July 27, 2014.